These autographs are on the reverse of a promotional photograph by Liverpool photographer Peter Kaye. They were obtained at the only concert the Beatles ever played in Warrington. The gig was at the Bell House on 20th July 1962. 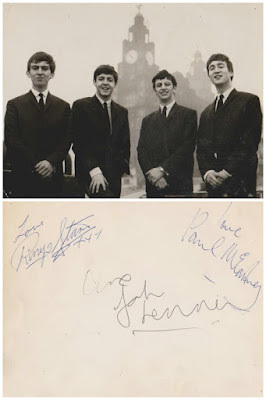 It is signed by John, Paul and Ringo. Unfortunately George had already left the venue. This item will be up for sale in our annual Liverpool Beatles auction in August. (see link on the right for details) The estimate on this item is yet to be determined.